Warhammer Tau: Black Templars...Then Tau? It's Black Templars first, then Tau in the line of new Codex books apparently. The rumour mill seems to have settled on this pretty firmly now. Ironically, this comes just after my rather ranty post about being sick of playing with and against Spess Mehreens. So black sprays cans at the ready, because yet another army of snorting, grunting, testosterone fuelled meat heads in armour are about to come storming across your tabletop! 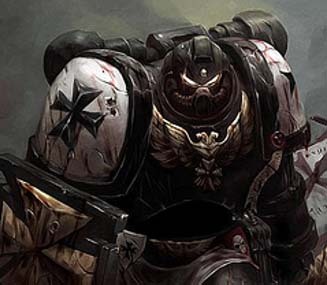 Word has it that the Black Templars will be awesome in close combat (as you'd expect), that they will be cheaper so that players can field hordes of them and that they'll have the old Pre Heresy Thunder Rhino as their 'special transport' which means assaults out of Open-Topped vehicles. There was also talk of a Chaplain Dreadnought and another 'big kit' which is the way Games Workshop are talking all the armies nowadays. Their focus is to try and make all the Space Marine armies as different as possible. Fair play to them. But What About The Tau? The good news is that apparently Eldar have been pushed waaaay back, leaving room for 1 xenos race amongst the menagerie of Marines -the Tau Empire. So while we cannot expect to be the 1st Codex of 2012, we should get a Codex IN 2012. Probably the same October release slot as the Necrons. The other bit of good news, although some of you may disagree, is that Robin Cruddace (who wrote Codex Imperial Guard) may be working on the next Tau Empire book. Or it could be Matt Ward bringing his unique brand of madness to the Tau Empire instead. Considering how good the strategic coordination and Orders system of the Imperial Guard was, I'd be happy for Cruddace to produce the Tau Codex. After all, we really do need all those Markerlights, hard wired and networked upgrades to be cost effective and function somehow. If Ward gets his hands on it, at least we'll get a very different kind of army from all the others and probably a huge range of battlesuits to choose from too. No doubt you will have noticed that I haven't mentioned many Tau rumours. This is because a lot of what's currently being discussed was mentioned years ago and sounds a lot more like wish listing. Or people simply suggesting good ideas and hoping that they're right when the time comes. So until we get close to their release date, the blog will be pretty quiet on the Tau rumour front. This is because nothing feels particularly solid right now, while the Black Templar rumours are being confirmed from a wide range of reliable sources. But one thing is for certain -the Tau Empire will be back very soon, and we'll be ready! Really? Uggg I am getting so frustrated with the constant let downs that GW is putting out. First my beloved Sisters of Battle and now Tau pushed back till after the end of the world. Thanks GW. Look on the bright side, because when Tau are released all we have to do is optimise to kill marines, because they are 70% of the armies now. I much rather have Cruddace do it than Ward. If she understand shooting well enough for IG, then I would say she's worthy to understand Tau shooting. Yep, that's what made me happy too. What i want to know is when they are coming out, either Febuary/March or October becuase i want to know when to save up and when to spend because i don't want to have to wait a year before the new tau come out and not have expanded my force. Thoughts anyone? Thats some good advice, i will buy some XV-9's.